NOTE: I use and recommend using organic ingredients whenever possible. Puree soaked Sunflower Seeds, Pumpkin Seeds, Carrot, Red (or Green) Bell Pepper, Tomato, Olive Oil, Onion, and Garlic. Mix in Flax, Chia, Cumin, Paprika and Salt. Mix should be a thick pasty consistency. 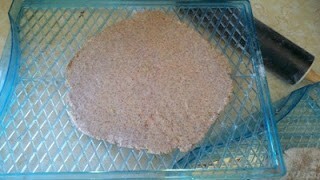 Add 1C Rye Flour (Substitute with any whole grain flour. White flour should not be used).